The following listings are abridged versions of actual auctions using live auctions, brokering services, eBay® auctions and other sales venues conducted by The Sell It Now Store™. They are included to demonstrate the diversity of items we sell, as well as the quality and success of our auctions. In actual auctions, we may use multiple photographs to represent our items. In some cases we post 400 or more quality digital photos and videos. We also advertise our sales though multiple sales channels in addition to the auctions. You are looking at a rare piece indeed - an extremely correct survivor 1960 Corvette with the correct 270 HP 283, Borg Warner T10 and 4.11 posi rear end, both tops, and the right colors. It is a very late 1960, appearing to be a mere 166 from the end of the run, built in late August 1960. It also has the original aluminum Harrison radiator and high RPM tach to support the 270 HP option, and a host of correct components. Probably one of the most correct cars I have seen. The paint is nearly all original, the interior is original, the generator, shielding, radiator and alternator, carbs, heads, and intake all original and appear correct. The radiator is the first year Harrison aluminum radiator, with even the correct cap. The plug wires are dated 1964, the tires are 1964 Firestone 500 bias belted tires (correct size). The dash is perfect as are the door panels. The steering wheel has no cracks. There is no front fender sag either. It is finished in Marlboro Maroon with black interior. Options include the 4.11 posi rear end, 4 speed, and 270H dual quad, as well as courtesy lamps, 2 tone paint, 2 tops, temp controlled radiator fan, heater, and a Wonderbar signal seeking radio. It does not have the optional e-brake warning light, visors or windshield washers. All the locks and keys are there and work. The rear bumpers are super, the front bumpers need plating. This museum piece would be a great NCRS or Bloomington Survivor candidate. Note the Maroon in the trunk still there from the assembly line and it still retains the original Guide T-3 headlights. I have tested all the electrical and it all works. The paint is nice, especially given the age but is not perfect. The paint appears mint in the photos but it is not that nice. There have been some small touch ups on the way and there are a few cracks and imperfections in the fiberglass. It does have some small marks that have been touched up as you walk around the car. There is also a crack behind the driver's door as you can see, and the hardtop rear window has a small crack near the center bottom. One of the interior kick panels has a small crack, the transmission shifter appears to be stuck in neutral from sitting. These are all very easy fixes and are to be expected given the age and storage. 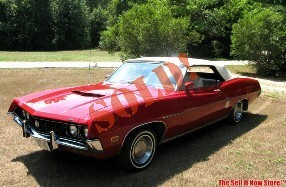 You are looking at a 1970 Ford Torino GT Convertible Survivor. This car is a 110,000 original mile survivor and is probably the most original classic cars we have had for sale in awhile. The condition is very nice for the age and aside from a repaint, it is pretty much as stock as you will find. Read on and scroll down for a large number of photos. This came from a local older owner who is very fussy and has had this car since 1972 as you can see by the title. He did not have children or marry, so the car didn't see much as far as passengers. In addition, check out the notes inside the hood to give you a good indicator on maintenance and how well it has been cared for. Mechanically, this car runs surprisingly well and has been well maintained. It did have a tuneup done recently that includes plugs, wires, cap, rotor and other small components. The brakes work well, and it drives straight down the road. While it is in great shape, remember it is 40 years old+. We also have not tested much of the electronics but what we tested did work. The lights all work on the outside and even the interior courtesy lights still work. The glass is also good with no cracks. There is even the ORIGINAL Polyglas tire and jack as shown in the photos. The original radio is also included. The owner has totaled his repairs over the years, and has around $7000.00 in receipts. The paint is far better than driver quality and still shines, but it does have some rust starting as you can see in the photos. The mileage appears to be correct based on the condition of other components and the receipts. Wisconsin looks at the car as exempt from odometer disclose due to age. Just to recap, cosmetically, the paint does have it's flaws as documented by the photos. We would leave the car as it is and enjoy it. However, it could easily be restored to new if desired as they reproduce everything for this car. Have you been looking for that rare music machine that no one else owns? Look no further as this is as rare as they come. You are looking at a survivor quality Tangley Calliaphone Air Circus Calliope Model CA 43S. The story goes that this was special ordered from Tangley years ago with the intention that only one would be made in brass. I can say we have never seen one before and this one plays perfectly. We are also including 5 rolls with this beauty and each roll has multiple songs on it. This is a nice original survivor that is from a local family. These machines are about as rare as they come, especially with one only known to exist in brass. Check out the incredible video to see this in action. It sounds breathtaking and much better in person. Please scroll down and enjoy the 50+ photos. If you cannot view all the photos, please click here. It is complete with blower and works well. It measures approximately 66 inches high by 26 inches deep by 32 inches wide and weighs approximately 300 lbs. It is in great cosmetic shape and has been well cared for. More information on this company can be found at http://www.minercompany.com/Calliope%20Page.html. This is being sold as part of an estate. The Boston Red Sox won four World Series in the eight years Babe Ruth played on the team. They sold Ruth to the New York Yankees for $125,000 and a $300,000 loan because Boston's owner Harry Frazee needed the cash to invest in a new play on Broadway. As noted since the cash transaction, Boston's inability to win a single World Series Title has been attributed to The Curse of the Bambino. Who could forget the infamous Bill Buckner error in game 6 of the 1986 world series? That error is without a doubt the most devastating and costly error in World Series history. You are looking at a 1986 World Series Official Ball stamped with the autograph of former baseball commissioner Peter V. Ueberroth. This ball has been preserved for nearly 20 years, and is in MINT condition. 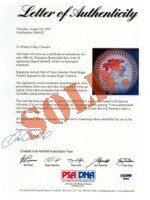 It has been signed by the entire 1986 MLB World Series runner up Boston Red Sox team. I am selling this baseball on consignment for a gentleman who worked at the Pfister hotel in the 1980's and 1990's. The Pfister is the premiere hotel in downtown Milwaukee, Wisconsin. When Major League Baseball teams come into town, they stay at the Pfister. Each signature on this ball has been thoroughly examined and authenticated by the top Grading & Authentication service in the country, Profesional Sports Authenticators (PSA). The ball is tagged with invisible ink laced with a synthetic DNA sequence/combination, specific to PSA/DNA and detectable only under a specially calibrated laser. The Letter of Authenticity is included in this auction. If you are a Red Sox fan, THIS IS A MUST for your collection. Buyer agrees to pay by certified funds only on this item. SORRY, NO PAYPAL. Bid only if you intend to buy and e-mail me with shipping questions or concerns PRIOR to bidding – deadbeat bidders will receive negative feedback. Please e-mail me with any questions. This will be boxed for safety and expertly packed. Shipping outside the US 48 states costs extra. Let me first say this is a consignment item from a person that had this slot machine back into the 1930’s. Take a close look at this beauty. It is a spectacular Caille center pull slot machine. These are about as rare as hen’s teeth. When was the last one you have seen for sale? It appears to be original with the exception of probably the back door and is missing the glass for the payout. I heard someone was reproducing it but am unsure if this is true. This machine has no repro parts that I know of and retains the original cash box. It does not appear to have been repainted anytime recently and is probably original paint. This quarter slot machine runs great. My dad has had Watling, Mills and Pace, but I really like this unit. It would be a great addition to any collection, barroom rec room or gameroom. US Shipping is $150 well insured and well packed – a custom fitted crate will be fabricated for this machine. Due to regulating laws the sale of antique slot machines, I, as the seller, will not accept bids from members in the states of Alabama, Connecticut, Hawaii, Indiana, Nebraska, South Carolina, and Tennessee. Due to this machine being 80-100 years old, it is sold strictly as-is-as-shown. Please bid accordingly. In lieu of shipping, you can pick it up in Franklin, Wisconsin, (near Milwaukee, or about 1.5 hours from Chicago). I will hold it for 30 days if you plan to pick it up. Pickup at the Chicagoland Jukebox Show in St. Charles, Illinois is also possible (prepaid). The show is in a Chicago suburb. I do not do second chance offers - if you receive one from what appears to be me, please report it directly to eBay. Buyer also pays by certified funds. Sorry, NO PAYPAL on this item. Bid only if you intend to buy and e-mail me with shipping questions or concerns prior to bidding on my item. Deadbeat bidders will receive negative feedback from me. 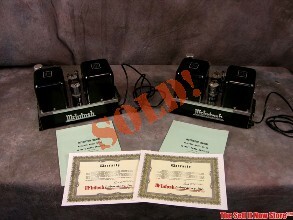 You are looking at a rare pair of McIntosh MC30 tube power amps. These are 1963 vintage and have been reconditioned professionally. They are ready for your preamplifier and speakers. These amplifiers were removed from an estate and are being sold with no reserve. Here is your opportunity to obtain the missing audiophile amps for your audio system. Sonically, they sound awesome. Due to the age, they are being sold as-is as with all electronics of this vintage. We did not attempt to remove the dust or clean it as we felt we would leave it for the next owner. Remember, we have no way to test or gauge the condition of the capacitors and other components. We routinely ship overseas to Northern Europe (Germany, France, UK, Italy and others, as well as Asia (Japan, Taiwan, South Korea, Singapore and China, and can ship this item worldwide. We pack extremely well and recommend FedEx International Great Rate, which prices vary due to availability. We are happy to quote shipping and if we can ship to your country. McIntosh Labs since the beginning, in 1949 has been synonymous with quality and sound production like no other product on the market. McIntosh Amps have served the best, from Pioneers like Les Paul, and Credence Clearwater Revival no other Audio System has added to the history of Entertainment like McIntosh. It was used at events such as Woodstock in 1969 as well. For those who expect the best, there is no substitute. If one expects the best sounds without distortion, and complete control of output of sound, then there is no other choice. You are looking at an Antique Steinway & Sons Model B Grand Piano. What a phenomenal piece that was manufactured in 1886 but updated in the 1950s with no expense spared. Read on and scroll down to see the hundreds of photos of this superb instrument. Also enjoy the video below of this instrument in action. This beauty is a 6'11" piano that has a serial number of 56405 which dates it to 1886. The cabinet was completely reconditioned and the instrument professionally re-strung in the 1950s which gives the piano a wonderful mid-century feel. He even replaced the trap work (pedal assembly) with all brass. Even more striking are the letters which are hand cut and inlaid brass letters. 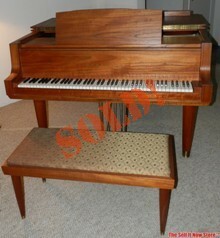 In addition, the bench and legs were re-worked to match the beautiful teak veneers used on the entire piano. It would be impossible today to reproduce this piano and it is in remarkable condition. It plays phenomenally and is truly a one-of-a-kind. New Steinway grand piano in wood finishes are approaching $100,000 and the Larry Fine book puts the number at around $30,000 to $35,000. Best of all, we are selling this beautiful piece at NO RESERVE. We will let the market determine the value of this beautiful piece of musical history. 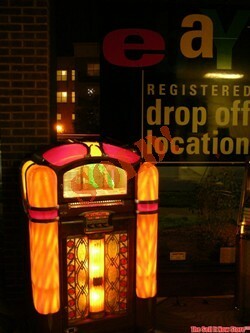 Have you been looking for that survivor quality 1948 Wurlitzer 800 jukebox? This is a nice original survivor that is from a local family. This machine was in their house for 50 years where we picked it up from. These machines are about as rare as they come, especially in this shape. Note that this machine is in nice shape for the age and appears to be original as far as we can tell. 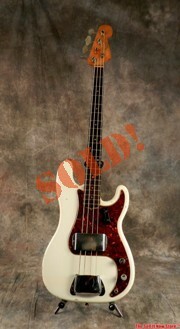 We are unsure about the finish, but the veneer, plastics, coin gear, amp and correct and original. The only flaw we could find is the lower right plastic has a crack as shown in the photos. The sides and finish are exceptional, the patina is superb! The photos do a great job documenting the condition. We could not find any reproduction parts on this box. Note the phenomenal shape of the foil grill. Note that we do not know what shape the caps and tubes in the amp are in. The jukebox does play well and select. Mechanically, it is in good shape but probably should be lubed up as it has been sitting. The history surrounding this remarkable piece is truly amazing. During World War II, an airline by the name of Pan American World Airways dropped all of its commercial flights and flew exclusively for the U.S. Military. Airports owned by Pan American located in the Pacific and Asia were used as military bases. In the mid 1950s, Pan Am was second only to Coca Cola in worldwide name recognition. Pan Am became the global leader in transcontinental travel by jet. As a result of their rigorous flight schedules, Pan Am pilots were the first afflicted by “jet lag,” a condition caused by making frequent jumps between time zones. Pan Am’s founder, Juan Trippe, became the first airline tycoon. He theorized that if pilots had a watch that would help them keep track of the time in their current time zone as well as their home time zone, the effects of jet lag would be milder. The original Rolex GMT master watch was developed by Rolex and Pan Am exclusively for Pam Am pilots, first officers, and navigators in 1958. Obviously, a wonderful relationship developed between Rolex and the airline known as America’s Imperial Airline. When Pan Am constructed its worldwide headquarters on 45th Street and Park Avenue in Manhattan, Rolex presented Juan Trippe with a gift designed to adorn the flagship ticket office. The Pan Am building (now the Met Life building), has it’s own history. At the time it was built, the Pan Am building was the world's largest corporate office building, and became the catalyst for the corporate architectural revolution that you see along lower Park Avenue. In the early 1970s Pan Am purchased too many 747s from Boeing, and the world oil crisis hit the airline industry hard. In 1980, Pan Am purchased National Airlines at a price far above its value. Unfortunately, Pan Am encountered financial hardship as a result of these events. The infamous Lockerbie crash of 1988 devastated the already ailing airline. Pan Am was flying half empty planes, and soon became unable to pay their employees. The once thriving company, which pioneered the international airline business, collapsed in 1991, and the Pan Am building was sold to Metropolitan Life Insurance. Amazingly, the gift presented to Juan Trippe in 1965, which hung proudly in the Pan Am building until 1991, is available in this auction. This phenomenal piece is truly a one-of-a-kind. The clock is 38 inches in diameter, and as you would guess, keeps impeccable time. You are looking at a 1962 Fender Jazz Bass Guitar. This guitar has been played as you can see but is original as far as we can tell. Please scroll down and enjoy the 40+ photos. It has only had 1-2 owners, includes a factory hard shell case. We are located in Waukesha, Wisconsin, birthplace of Les Paul. This Jazz Bass is a superb instrument. If only this guitar could talk. The patina and mojo are outstanding, and it plays well. The action is great, and it feels really good. The controls and jack need cleaning but it does work. It should also be set up just due to age. The stand is not included. We can ship this guitar worldwide and will pack it extremely well. We are very well versed at packing and shipping, and we can ship both USPS and FedEx Great Rate for very competitive rates. We are happy to quote shipping - just drop an email with your postal code or use the eBay shipping calculator. You are looking at rare item indeed. This is a beautiful 4 piece Sterling Silver Tea set crafted by Edward Vogel of Sheffield England. Style of Queen Anne, shaped in manner of George III. This unique design includes pear forms and angular shape handles. The coffee and teapot handles are Ivory insulated. There are also ivory inserts in knob finials on all covers. Date letter 1956. Please note that this tea set is solid sterling sliver, not silver plated like many of the sets that you see on eBay. This set is in excellent condition, and was recently professionally polished at a cost of $400. This tea set is being sold on consignment. The modest reserve on this set is a fraction of the appraised value. The appraisal is included with the auction. Since this is a consignment item, I've been asked not disclose the reserve. Please do not ask. Buyer agrees to pay by certified funds only on this item. SORRY, NO PAYPAL. Bid only if you intend to buy and e-mail me with shipping questions or concerns PRIOR to bidding – deadbeat bidders will receive negative feedback. Please e-mail me with any questions. This item will be boxed for safety and expertly packed. Shipping outside the US 48 states costs extra. The Contents of this site are Copyrighted© 2006-2018, The Sell It Now Store™, All Rights Reserved. eBay is a registered trademark of the eBay® Inc. Designated trademarks and brands are the property of their respective owners.